Economic growth is expected to slow down to 2% in 2016 on account of a major decline in investments. 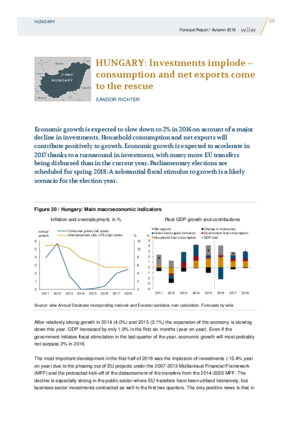 Household consumption and net exports will contribute positively to growth. Economic growth is expected to accelerate in 2017 thanks to a turnaround in investment, with many more EU transfers being disbursed than in the current year. Parliamentary elections are scheduled for spring 2018. A substantial fiscal stimulus to growth is a likely scenario for the election year.